Evelyn started her first part-time skin care business in 1993, and in 1998 opened Elevations Day Spa, Big Bear’s first day spa. She sold the spa to Debby & Garry Dokter in 2005 to pursue her RN education, which she completed in December of 2012. During her 22+ year aesthetic career, she always remains current with many skin care protocols such as chemical exfoliation and peels, micro-dermabrasion, derma-planing, skin-stamping/needling, and micro-current treatments. She also offers over 25 years of experience with permanent makeup application, inspired by her previous career as a professional makeup artist. Evelyn has been intensively training in the medical aesthetics profession since she has earned her RN license in February of 2013 and is now offering her caring touch and expertise to her clients with a new twist. She has joined Dr. Michael Norman D.O. and his team at Desert Mountain Medical Group. Here, we offer a multitude of medical aesthetic treatments such as laser hair removal, laser skin rejuvenation, injectables, skin needling, PDO Thread Lifts, and the only FDA approved non-invasive procedure for skin lifting and tightening, Ultherapy. Evelyn can be found at Elevations Day Spa in Big Bear Lake, at Salon Suites in Palm Desert and at Desert Mountain Medical Group in Apple Valley. As the exciting world of beauty and wellness continues to evolve with amazing break through discoveries, Evelyn has enjoyed the challenge of keeping pace with the most current treatments, techniques, and latest procedures. 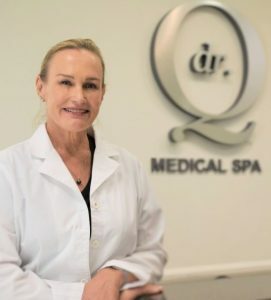 For medi spa appointments in Big Bear, Apple Valley or at Dr. Suzanne Quardt Plastic Surgery office in Rancho Mirage, Evelyn can be contacted at evelynbeaman@gmail.com or 951-236-6245.